Pictured: All of us looking for 4th level. Not pictured: Anyone finding it. At this point, Fourth Level looms at me like something from my nightmares. 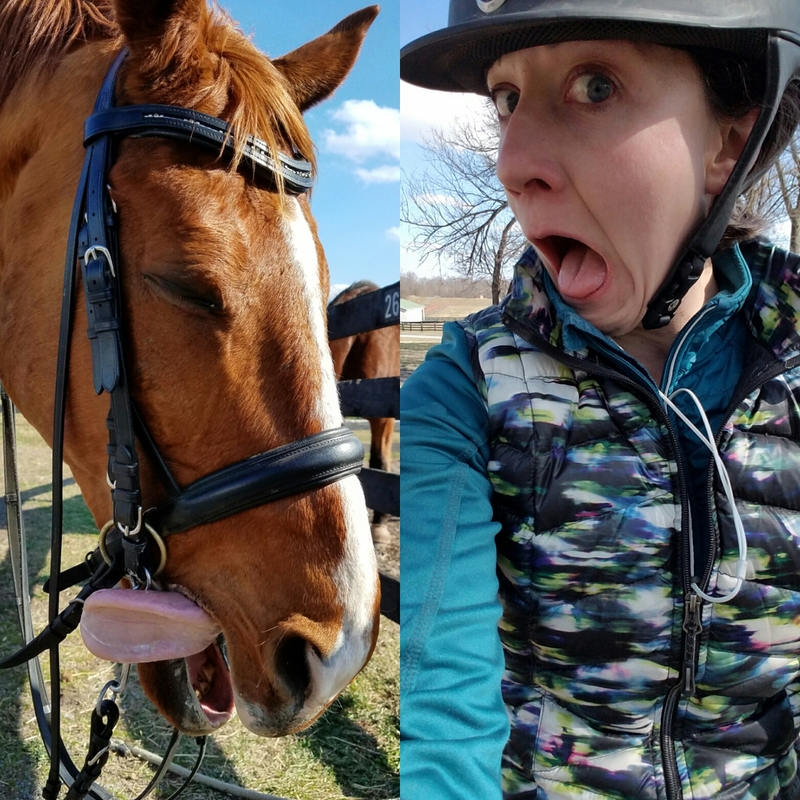 On our best days, Pig feels like a confirmed horse. On our worst, I feel like I'm trying to coerce a shoulder in out of a thrashing fish. (There's a visualization for you!) In an effort to give myself a little more focus and confidence in our training and progress, I've started looking more closely at the requirements of fourth level and the test I'm focusing on the most, 4-1. USEF states the purpose of Fourth Level is: "To confirm that the horse demonstrates correct basics, and has developed sufficient suppleness, impulsion and throughness to perform the Fourth Level tests which have a medium degree of difficulty. The horse remains reliably on the bit, showing a clear uphill balance and lightness as a result of improved engagement and collection. The movements are performed with greater straightness, energy and cadence than at Third Level." 1. Horse remains reliably on the bit. Exhibit A. Horse on bit. This is really not an issue for us any longer. We have mild blips, but he's very willing to get back to work after them. I would call this quite reliable, and much better than last year. 2. Horse shows a clear uphill balance and lightness as a result of improved engagement and collection. This is a bit harder for me to see. With Pig being a thoroughbred, uphill tendency tends to look a bit different in him than the fancy warmbloods I'm used to seeing. Plus, his tendency is to travel fairly earthbound through his shoulders. That said, I think we have some improvement to our basic gaits. Our average trot right now. The trot is much improved since our work last year. Pig finds lifting his withers much easier, and doesn't struggle as much in the connection when I ask him for more. We could use more overall engagement, but for a daily work trot I think this is good. He'll give more when I ask, but I'm leery of stressing that stifle more than necessary. Status of the canter, more questionable. The canter is less confirmed. I spent the autumn and early winter fixing the incessant 4 beating fault we'd developed during our quest for relaxation. Now I'm working on reconciling that with a lifted wither. We really struggle when it comes to getting Pig to lift his front end at the canter and keep his back loose. I'm 99% sure that difficulty comes from a reluctance to articulate the hip/stifle. When he feels good, this is easier. When he isn't as confident he can do it pain-free, it is not. We take things day by day. That said, the gait quality is much better than it was last fall and the roundness hasn't totally disappeared. I'll take it. Also, that walk photo on the right. Wtf horse. Did you forget that leg was attached? Jesus. 3. The movements are performed with greater straightness, energy and cadence than at Third Level. Can I get a HELL YES? Seriously. Can I? I'm extremely happy with how quickly he comes back to a balanced and relaxed canter following that... ahem... moment. There was a time a wild effort on a change would have left us bolting headfirst into the wall, or me nearly flying out the window. Let's give a momentary cheer those days have started to recede into the background. Other movements are coming along, too. Notably the half pass where we are working to increase the bend (and therefore the engagement). Needs more bend, gets more bend. That left ribcage is quite the stubborn thing. But, NBD. We're fixin' problems like a boss. Now, as we look specifically at the 4-1 test, there are a few new movements for the test: collected walk; very collected canter; walk pirouettes; multiple flying changes on diagonal. Accurate representation of our exact reaction to those movements. I have no video evidence of the walk pirouettes or very collected walk. It's coming along, though. Turns on the haunches have been our strength for a very long time, and Pig is translating that work to walk pirouettes like a champ. I'm not too worried, as long as I can keep that left hind from stepping wide when it should be stepping in. The very collected canter, developing into a working pirouette by the end of the the level, is something we've really started to hit hard. While we're making progress, I need to be sure not to wear out Pig's joints with this work. It's really hard, and when he's sore he's a total pill about literally everything else (and who can blame him?!). It's not worth it to push this too far. He's getting the idea and building strength. Right now the biggest issue is keeping his power up when we finally get the hip to drop. I'm paying close attention to my reins, as any pulling will just STOP his hind legs in their tracks. Still, it's a careful balance. I find myself using haunches-in on a circle to help develop the feel, ala a Jeremy Steinberg clinic tip. This exercise forces Pig's hip to sit, allowing me to ask for more power and a yielding ribcage. It's really a great exercise, and is helping us develop lift in the shoulders. Again, I need to be conscious of not over-using it. Keeping the circle large is also key to ensuring this exercise doesn't earn me a one-way-ticket to tantrum land from my poor overworked creature. Finally, we get to the truly nightmare-inspiring addition: multiple flying changes on diagonal. As a single change was a major struggle until recently and I am no wizard at teaching or riding changes, it makes sense why this addition intimidates me. I don't think I'm alone, either. Tempi changes take a lot of organization, relaxation, and timing to pull off. I think everyone moving up to 4th feels like they could use a lot more of all of those skills. Still, I've been pretty confident in our ability to at least get three changes across the diagonal. (Noticeably much less confident about our ability to do them cleanly or not careen through the wall of the arena at the end, though) The development of relaxed single changes has given me a lot more confidence in this, and I've started adding multiple changes into a few of our rides. Just to test, you know. Hold your applause, please. You'll spook the horse. Also, yes. I know that second change was really late. See above about fixing that one. At the moment two changes without bolting headlong into a tree is pretty reliable. Even on a bad day*. This is crazy to me. We can get three, but usually that's a bit too much for Pig to keep a lid on his exuberance. At that point I tend to lose a half halt for at least 5 minutes. Not exactly ideal, but we're getting there. This is huge news. Honestly, this is news I never thought I'd share. I'm keeping work on multiple changes to the long side for now. It's easier to keep them straight over there, and easier to keep the wild dragon at bay. For some reason changes in the middle of the ring are crazy exciting. Horses are weird. Too bad they don't offer a pas de deux with dogs in USEF. We'd nail that. Just sharing this post makes me feel a lot more confident about what is ahead this season. While I'm sure we'll struggle to get anywhere close to a 60% at 4th this year, I'm insanely excited to give it a try. Especially on this happy red horse. We just have a lot of muscle, timing, and confidence to increase this year. What upcoming challenges are keeping you up at night? Do we have any in common? Honestly, I love the hell out of his exuberance. It remains clear that he does enjoy his job, even if he isn't always the most confident or obedient of dressage horses. Haha! The field is actually where I started doing multiples of changes. 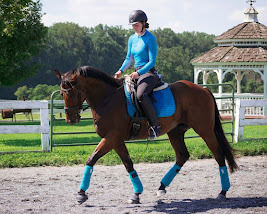 It's so easy to run out of room in the ring, and I wanted to introduce the idea of a second or third change relatively close to the first without the added pressure of running out of room or balancing for a corner in counter canter on my mind! I think that was a HUGE help! We've just started doing them in the ring recently, and the work in the field is definitely carrying over. And I'm excited to be at your first big show. Camera will be in tow so you can have all the mediaz. This is just beyond exciting! Your "not so great" days look pretty darn awesome. I hope I can make it to one of your shows this year!! Oooh! Please come out! It would be so much fun! Plus, the pony dressage scene is starting to pick up around here, and photos just don't do the adorable buggers justice! Great post!He looks awesome. I think 4th level is clearly in your near future! Man, I hope so! Crazy to imagine, though! and no we don't have anything in common, right now :P actually I take that back. sitty sitty roundy roundy is a common theme for everyone, even baby runkles. Sit! Sit! Sit! Always more sit! Yup you will be just fine at 4-1 lady!! Looking great! :D I love love love watching bloggy people move up through the levels. So excited for you! I love watching you guys progress and I love that you are realistic about where you struggle while actively seeking out and developing solutions (and keeping your horses physical needs in mind). Wow. I'm super excited for you guys. It's looking really good. Damn girl, y'all are looking GOOD! IF ONLY PAS DE DEUX WITH DOG WAS A THING! But how would you find any horse matching those husky markings?!! 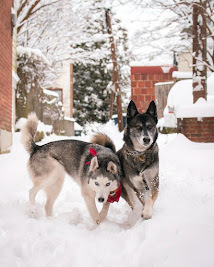 If I ever find a horse with husky markings, you can guarantee that sucker will live in my barn. 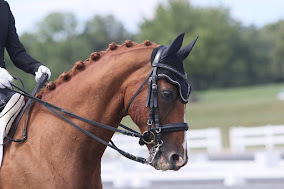 I love watching your pony progress--it's an inspiration for me and my pony. We're working on trying out first level this year, not fourth. Our consistency and using that power in his hind end for good instead of evil is what keeps me up at night. Super inspirational! Good luck with the move up! Man I remember back when we first started talking... all those videos of changes you showed me, such a huge improvement! Great job! You guys are looking awesome! I totally think that you can do this and am rooting for you. Looks really good! I'm so excited for you, I think it will go well for you guys. I also think "sitty, sitty, spinny, spinny" when doing pirouettes hahah! I'm sorry but HE LOOKS FANTASTIC IN GREEN!! !